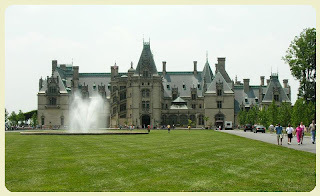 After watching Hannibal about sixty two times -- I didn't like it at first, but it's, ahh, grown on me, and really liking Mason Verger's little pied à terre, we decided to take a small detour off the interstate and head for Asheville NC and the film's location site: the Biltmore Estate. And I don't know why, but watching Hannibal always makes me hungry. Curious. But the house! It's big. Really, really, BIG! Picture the biggest house you would build if you won the $500,000,000 Powerball lottery. Okay, got that image in your mind? It's bigger! I'd be happy with the driver's apartment over the garage. And still in Vanderbilt Family private hands. In fact, I believe it's the largest house still in private hands in America. There's a hefty admission price (from about $30-60 depending on day & season), even with my senior's discount. I love America: in Canada, I have to wait years before claiming any sort of senior's discount; In America, I just flash that AARP card (which you can get at fifty) and away we go. But it is magnificent. And there's a shuttle bus that takes you from the various parking lots up to the house. I love saying that: there's a shuttle bus that takes you up to the house. Anyway, after the tour, we drove into Asheville for breakfast. Now, I'd read Holley Bishop's book Robbing the Bees about the art of well, robbing the bees. A biography of honey, she says. This book was right up my alley, and believe you me, it's a very tight alley (I have issues). I love social histories. I've read the various histories of Cod, Salt and Sushi. What fun. Much of Bishop's research was spent at the Smiley Apiaries in Northern Florida and they have a specialty: Tupelo Honey. Smiley's is also the setting for Peter Fonda's film Ulee's Gold . He got an Oscar® nod for that one and Van Morrison sings "Tupelo Honey" over the closing credits. But Smiley's in the Florida panhandle is just a wee bit out of our way, but right here, in downtown Asheville, is our destination: (insert fanfare here)The Tupelo Honey Cafe, where they serve (and sell) Smiley's Tupelo Honey. Go figure. What a coincidence. So we had brunch: Petunia's Pain Perdu, a chalah french toast with almonds and edible flowers; and the sweet potato pancakes. In France (and Asheville) they don't call it French toast, they call it a Burger Royale pain perdu. And naturally we drizzled Tupelo honey over everything. And so I bought a case of the stuff. 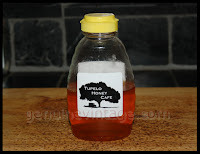 Not just for us you understand, but we have poor, sickly, needy friends who are diabetic and are forbidden honey; but now some doctors for some patients will allow them to have Tupelo Honey because of its low sucrose levels. It also doesn't solidify, so you never have to do the whole double boiler thing. And oh joy of joys, you can order this stuff by mail from Smiley's or try Amazon.com for another brand: Savannah Bee Company's Tupelo Honey.